Various other SMA accessories are available on request. 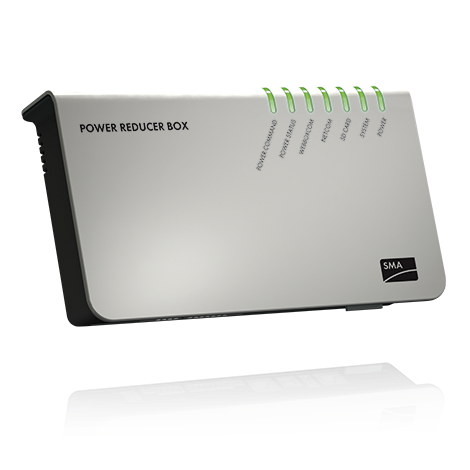 With the Power Reducer Box, SMA delivers a solution for PV plants that take part in feed-in management. It allows the grid operator to remotely control the plant performance in cases when the grid is overloaded. It achieves this by translating the transmitted setpoint values into control commands for the Sunny WebBox, which forwards them to the inverters. During this process, each change of status is logged several times, once in the Power Reducer Box and once in the Sunny WebBox. In addition, the grid operator’s requirements are visualized in Sunny Portal. Sunny Portal immediately informs the plant operator via e-mail about power limitations that have been undertaken.